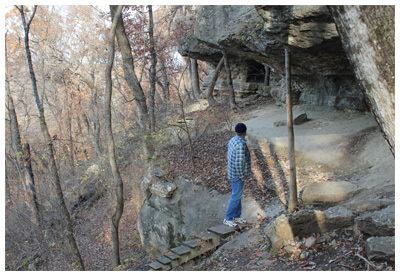 oklahoma – Tour Guide Mark – Let's Go Exploring! Discovering an arrowhead is an exciting experience. During a walk, along with a lonely deer trail in eastern Oklahoma, the easy-going path had suddenly become overgrown and was impassable. 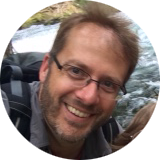 The detour included traversing a variety of barbs, briars and scrambling over several fallen logs close to the river. The result led to a spectacular discovery. Overlooking the edge of the water, between the tangles of roots was a small ‘beach’ area no longer than twelve feet. In the middle of this sat a tan-colored arrowhead (also known as a point) about 3 inches long. I spent a good number of minutes scrambling down the rough ten-foot bank, being poked, scratched and stabbed by branches and roots in the most uncomfortable of areas. Finally, I reached the shoreline. I saw the point, it was now partially covered by the gently lapping waves. I carefully looked around but saw nothing more. I snapped some photos to document the find that had been literally hidden at my feet. I carefully approached. The point was being covered by the black sand and mud of the river and in another fifteen minutes would be hidden from view for possibly years or decades or centuries to come. I squatted near the point and studied it carefully – it was one of the most perfect points I have seen. The point had very distinguishable tangs (tangs are used for affixing the point to a shaft). 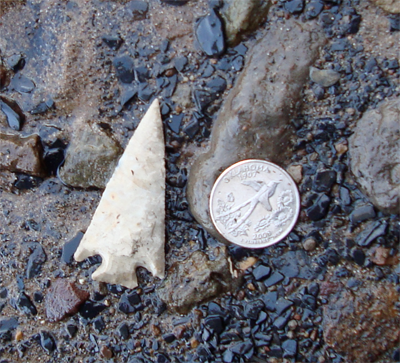 The point appeared extremely sharp and the arrowhead was very thin. I found a twenty-five cent piece (which happened to be an Oklahoma quarter) and laid it next to the point for a size comparison. 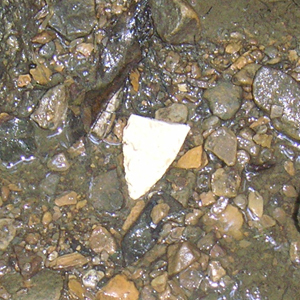 As I sat at the river’s edge looking at the point I knew one thing; this arrowhead was not just a stone, rather it was a method of communicating. The person who cared for their work had unknowingly reached hundreds of years into the future to tell me – a stranger – that they had lived. With each step that day I wondered what other stories were beneath my feet. The lonely deer trail was no longer lonely. Note: The land was private. The design of this arrowhead, for the location, was between 1300 to 500 years before modern times. Exploring old country roads can reveal hidden stories about America’s past. 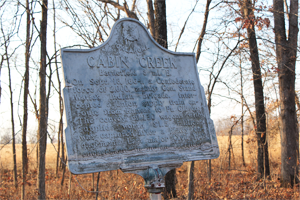 While traveling through a quiet corner of eastern Oklahoma I came across the Cabin Creek Battle Site, where Union and Confederate forces engaged during the Civil War. It was a cold autumn day when I visited and the temperature outside was near freezing. The woods were still, only disturbed by several does as they walked slowly over the dry leaves. 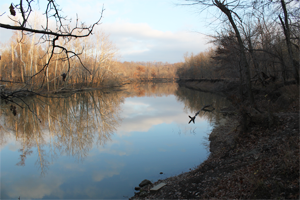 The battle site sits near the banks of the wooded Cabin Creek (shown above) and an open field. This area was once part of the strategic Texas Trail, the highway of its day where thousands of settlers, wagons, and cattle-drivers would use the route to travel between Kansas/Missouri in the north and Texas to the south. This place is quiet and small. Visitors are greeted by a lonely gated entry as you drive down a flint-gravel side road. The battle site itself consists of a small loop with several lonely markers and a few benches. 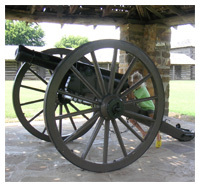 A caretaker’s house is nearby, but there is no visitors center, no paved parking lot, no restrooms, no expansive field where you can walk among manicured grounds or maintained fortifications. The site is very spartan in facilities, but that only reinforces that something very genuine lingers at this place. Walking around the site a visitor can see etched stones identifying the locations where the soldiers fought. It is easy to visualize distances because they are so close. It is easy to toss a rock to the opposite markers without much effort. This must have been a very in-your-face, bloody, personal and intense place. Seeing the proximity it became easier to imagine the deafening noise of gunfire, clouds of smoke, bullets whizzing past, the ground littered with shards of shattered trees and hearing screaming in the distance from wounded companions as they received Civil War-era medical care. Then I imagined such a battle not on a cold day, but during an Oklahoma summer (when these battles were fought); and having to fight not just against other people, but also against the unrelenting hot and sweltering summer day with 90% humidly which would make any physical activity torturous after just a few minutes of exertion. During mid-day, the battles probably consisted of shouting insults across this small plot of land taunting the other side until cooler hours allowed for the conflict to continue. But worse would have been fighting the things you could not always see: quick and annoying mosquitos, poison ivy plants carpeting the ground, stealthy ticks and unseen armies of chiggers that bite and leave itchy welts on the flesh. I left with greater respect for this place where blood between Americans had been spilled, yet an uncomfortable feeling stayed with me for several days. This quiet location on an old country road had spoken in unheard ways about these tumultuous times. Two battles were fought here; one in 1863 favored the Union, the second in 1864 favored the Confederates. A great amount of history occurred in this tiny area of land. The second battle in September 1864 is described by two markers in the area. 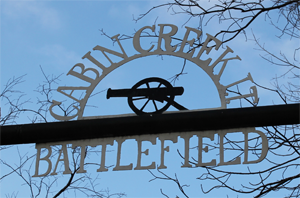 “Cabin Creek Battlefield…a Confederate force of 2,000, mainly Gen/ Stand Watie’s Indian Brigade, intercepted a Union supply train en-route from Kansas to Ft. Gibson. The convoy of 130 wagons with supplies worth $1.5 million was captured after a heavy engagement.” A second marker states the spoils that day included the wagons, plus 740 mules which were also heavily loaded with supplies. This second battle was credited as being a major morale booster to General Stand Waite. Stand Waite was the last Confederate General to surrender at the end of the Civil War. Driving thirty miles just for breakfast seemed extreme and a waste of gas, but Grandpa had spoken. Our morning drive took us through town and out in the eastern Oklahoma countryside of prairie and gently rolling green hills. Cows dotted many of the fields like pecans on hotcakes. Grandpa’s 30-mile drive was not so much about breakfast, as it was spending time with family while enjoying some beautiful scenery. Within half an hour we arrived at a small and simple building located at the edge of a dusty farming town. Inside was a large sparsely furnished room filled with a dozen well-worn tables. A small wooden cross was the only item displayed on one wall, two walls featured framed pictures related to farming and cattle. On the fourth wall were the register and several racks filled with baked items. Next to the racks was an unkept bulletin board with postings of local church events, carpentry work, horses for sale, and bulletins about veterinary services. The folks eating breakfast worked in the livestock and farming industries. Sitting at one very long wooden table, which was set slightly apart from the main dining area, were several modestly dressed Amish families. They were speaking in hushed voices. At the far end of the dining room, just under the cross, was a large yet utilitarian buffet cart. Inside were golden waffles, fluffy scrambled eggs, thick slabs of bacon, and medallions of freshly made sausage. Adjacent was a smaller cart containing bins of large biscuits and what looked like real gravy – not the fake stuff. At a side table was a bank of pitchers that housed milk, orange juice, coffee, honey, jams, and cream. All of the food, with the exception of the juice and coffee, had been produced locally on farms and prepared fresh. As Grandpa and I served ourselves the kitchen door quickly swung open and a thin muscular man wearing an apron came out to re-stock the food trays. He was carrying a large bin of waffles. As the door swung back it provided a glimpse into the kitchen, inside were several women hard at work, they were dressed in simple garments that harkened back to an older age. I said to the man, “Good morning.” He said nothing, only politely smiled and nodded as he took inventory of the food and restocked what he could before returning to the kitchen. As we found a table we passed two grizzly-sized men eating their breakfast. These men reeked of a hard day’s work and a no-nonsense attitude. They were dressed in dirty jeans, worn flannel shirts, and appeared to be returning from a work shift rather than starting their day. One man was using a fork as a stabbing implement rather than a utensil for eating. The other man chugged a glass of milk, the glass appeared tiny in his massive hand. Instead of speaking they used grunts and low tones. These were intimidating fellows. After cleaning their plates they swaggered to the buffet and restocked with copious quantities of sausage, biscuits, and gravy. Ten minutes later the two prepared to leave, but a good supply of food remained on their plates. As they gathered their jackets and started to stand a young Amish girl of about 12 years, who helped at the restaurant, approached and politely chided the two for taking too much food. She only said, “Food is a gift.” Then motioned with her hand to the sign posted on the buffet. One man was still chewing, and at hearing the interruption he stopped for a second then slowly continued his bite – unsure how to react. he glanced over and read the sign. The girl crossed her arms and pinched her mouth to reinforce the point. The two giants glanced at each other. A few tense seconds passed – it was a standoff! Nobody moved. Then she slowly began to tap the tip of her foot on the floor. At that moment some unseen boundary was crossed because fear now appeared on the men’s burly faces. One man respectfully said, “Yes Ma’am.” He sat down, quickly followed by this friend. The girl thanked them and returned to her duties. The two cleaned their plates, bused their dishes, and left a respectable tip in the church donation jar. In another part of the bakery, Grandpa had scoped out the pecan pies that were on display. He had identified the pies that were still warm. Then he asked a young woman at the register for her help. She told him in great detail about the number of pecans in each pie, the number of eggs used, the crispiness of the crust, and the density of the filling. Two pies were in the final run-off; both had been baked early that morning, each flaunted a crispy crust and were golden brown on top, they also had a wonderful aroma. He wrung his hands together over and over. The decision was too much so he bought both pies. One of the pies was enjoyed with relatives at a family dinner. The other pie was enjoyed with Grandpa over the course of two evenings as we told stories and laughed. Some of the most interesting places are located just a short drive off the main road. 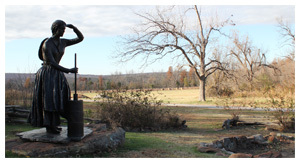 Sequoyah’s one-room log cabin in the beautiful forests and hills of eastern Oklahoma is just such a place. Sequoyah is known as the inventor of the Cherokee’s nation’s written language. 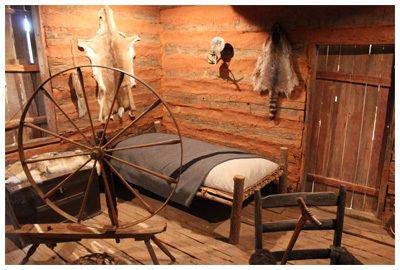 He built this cabin in 1829 shortly after his move to what is present-day Oklahoma. Sequoyah was born about 1770 in Tennessee to a Cherokee mother and non-Indian father. Sequoyah was intrigued by “the fact that white men could convey messages by the use of writing or ‘talking leaves’…. Sequoyah came to realize that the Cherokee language is composed of a set number of reoccurring sounds. With this insight it was possible for him to identify and create a symbol for each sound, thus producing a syllabary rather than an alphabet.” After 12 years of work, in 1821 he completed the Cherokee syllabary. The drive to the cabin takes visitors along some beautiful country roads. The first thing you notice when you enter the grounds is the air – it is clean, moist and just makes you feel good. The next things you notice are the well-maintained grounds followed by how solid the buildings are constructed. It is obvious this is a well loved and appreciated landmark. The cabin is actually preserved inside a modern building. 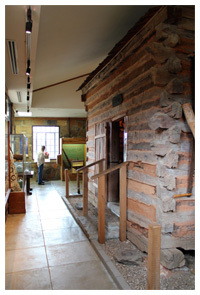 After opening the door of the outside building you enter a single open room; at the center is a hand-hewn log cabin, along with the walls, are displays about Sequoyah’s life and his work. 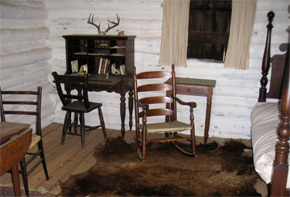 What is nice about this exhibit is that visitors can actually step inside his cabin for a close-up view of the period furniture and items that would have been in his life. Unlike many places that hide stories from the past behind cold glass, this landmark is open, inviting and warm. The people working at the landmark were all friendly. 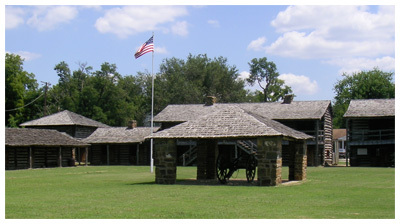 Sequoyah’s cabin is located about 6 miles northeast of Sallisaw, Oklahoma, on State 101. The cabin and grounds are open Tuesday – Sunday. Check the website for hours. Admission is free. The cabin is preserved as a National Historic Landmark. A special ‘thank you’ to Arethia Stann for her introduction to this great place and a tour of the surrounding countryside. Wado, Arethia! “Grandpa, there’s a toad in the drainpipe,” Anna exclaimed! The sudden and intense summer rain had quickly filled the rain gauge. Critters in the front yard were finding refuge. A small toad apparently found sanctuary in a drainpipe only to be washed away as the rain intensified and quickly flooded the downspout. Anna saw the toad being tumbled along in the torrent of water. She reached down, carefully cupped her hands and picked up the drenched toad. The toad sat motionless. After several seconds the toad looked at Anna. She studied the big eyes, wide mouth and bumpy skin of this odd creature. The toad apparently studied the small eyes, small mouth and non-bumpy skin of this human. After a minute the toad seemed to sit more comfortably in Anna’s hand. Anna held her hands out and proudly showed this very content toad to the family. Thunder rolled in the distance. The rain fell more gently now but the previous downpour had washed away the toad’s abode. 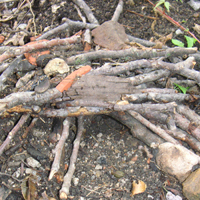 The toad needed a new home and an industrious seven-year-old had the answer – a new toad house. But how? The family discussed several options. Grandpa suggested placing the toad near the massive toad home that dominated the front garden. Anna called this monolith Mount Toady. Mount Toady was a large rock supported by multiple stones which formed caves and alcoves at the base. Surrounding the mountain was a lush garden of plants, rooted in rich soil and inhabited by yummy earthworms. To a toad, it was paradise. 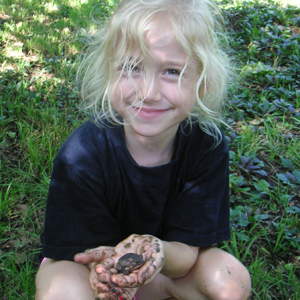 Anna had her own idea of a toad home and asked Mom to hold the toad. Mom took the toad and peeked around her fingers into her cupped hand – Mom peered in at the Toad, the Toad peered out at Mom. Anna found a high spot on the ground that was protected from future flood waters. She dug a shallow hole with her hand then raced around the yard and collected sticks that were about a foot long. The thumb-sized sticks were used as a base. Smaller sticks were crossed to form the roof. After a few involved minutes, the toad had a new house. Mom transferred the toad back to Anna who proudly introduced the toad to the new structure. The toad quickly hopped away but could not avoid the determined and quick hands of a child. 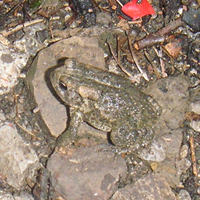 The toad was again placed near the house, this time the toad made good use of the home. A modern yard can reveal a hidden past. Anna the seven-year-old eagerly walked up the channel of a rill. The rill flowed through Grandpa’s front yard. The rain from several days earlier made the rocks glisten in the sun. 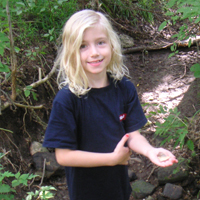 After several minutes Anna showed Grandpa something she found – a triangular, white flint rock with chipped edges. She had discovered an arrowhead in the front yard. The arrowhead was broken, but the excitement was not diminished. Grandpa believed the whole point was originally several inches in length. With a new sense of discovery Anna eagerly agreed to see some similar things that Grandpa had found. 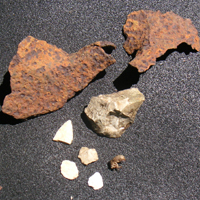 One item, the pocked and rusted remains of a cast-iron water kettle had been found only a few feet upstream from where Anna had discovered the arrowhead. A local antique collector had dated it to the mid-1800s. 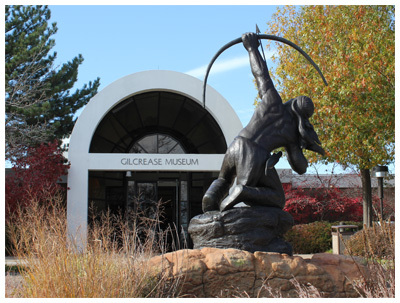 Exploring this simple question led to a week of family involved outings, including visiting local history museums, hiking to old homesteads, reading books about frontiersmen and native peoples and hearing the stories of old-timers. Anna’s front yard discovery provided all of us with an opportunity for reflection, some great family time and a renewed appreciation for the local heritage. Anna kept looking for other front yard finds. She and Grandpa did find a few flint chips, but another discovery was found the next day while hiking – Anna found a small flint thumb-scraper. Grandpa was impressed.